SYDNEY—Millions of Tibetans are celebrating Losar, the Tibetan New Year. It’s the biggest holiday in the Tibetan calendar, but celebrations inside Tibet have been subdued or cancelled in recent years due to tension under China’s rule. But in exile communities around the world, Tibetans are helping to keep the culture of their homeland alive – even ‘down under’ in Australia. On a Saturday afternoon in north Sydney, dozens of Tibetan children rehearse traditional songs and dance at a local community center. About 90 children attend Tibetan language and culture classes in Dee Why, a small Australian beach town where hundreds of Tibetan refugees have settled. Local Tibetan leaders say there are at least 1,200 Tibetans living in Australia. Most are refugees who fled to India from Tibet, although some were born in exile in India. Despite their relatively small community far from their roots in the Himalayas, the Tibetans strive to keep the spirit of their homeland alive. Tencho Gyatso, the Dalai Lama’s niece, visited Australia earlier this month and met with Tibetan exile communities. She works for the International Campaign for Tibet, an activist group based in Washington D.C.
“We talked about the challenges of raising children and living lives as Tibetans but now also as Australian-Tibetans, so taking on new identities and learning to weave their life into this new country. I think they’re doing an excellent job,” said Gyatso. Sydney has Australia’s largest Tibetan community with more than 700 Tibetans, followed by Melbourne with about 400. The community has grown rapidly in recent years as more Tibetans in India, where the Dalai Lama is based, are granted humanitarian visas by the Australian government. Tibetans can attend free English classes and vocational institutes and get other support from Australia’s social services. But older Tibetans and those with little education often struggle with learning English, finding jobs and adapting to life in Australia. In front of a packed hall in Melbourne last month, musician Tenzin Choegyal sang the Tibetan national anthem. “We are allowed to sing this song in exile. If you sing this song in Tibet then you can be persecuted. It’s to honor the courage of Tibetan people within Tibet,” said Choegyal. Displaying the Tibetan flag and images of the Dalai Lama in Tibet also can be cause for persecution by Chinese authorities. China accuses the Tibetan spiritual leader of being a “splittist”, even though the Dalai Lama only calls for autonomy under China, not separation. In part because of this conflict in their historic homeland, Tibetans abroad focus on preserving their culture despite their relative isolation in far flung communities. Since street protests in Tibet in 2008 that led to an intensified Chinese crackdown, some Tibetans began observing “Lhakar” or “White Wednesday.” Each Wednesday, Tibetans wear traditional clothing, eat Tibetan food and patronize Tibetan businesses to support their culture. In Dee Why, where Sydney’s Tibetan community is based, Tibetan men and women in traditional tunics and chuba dresses can be spotted amid the shorts and flip-flops worn by beachgoers. Dorjee Dadul emigrated to Australia in 1980 and helped start the Tibetan language classes in Dee Why in 2002. “Culture is the very identity of Tibetan-ness. Without culture and tradition then there’s no more Tibet. We can be anyone — Joe Blow, citizen of Australia,” said Dadul. While retaining their own cultural identity, Tibetans here also participate in local holidays. On Australia Day on January 26, hundreds of ethnic groups paraded through Melbourne’s city center in a colorful celebration of the country’s multiculturalism. 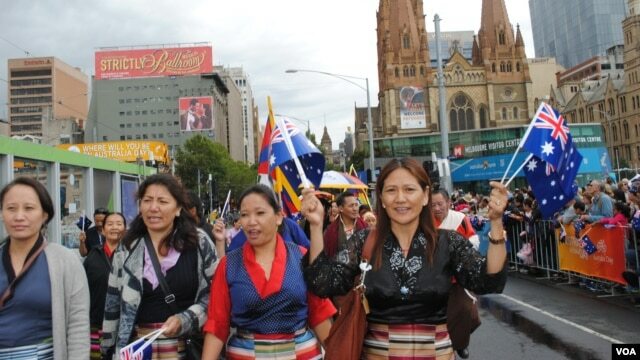 More than 70 Tibetans wearing traditional Tibetan outfits joined the throngs and waved Tibetan and Australian flags. Thinley Jigme arrived in Australia from India four months ago. He marched in Melbourne’s Australia Day parade and his eyes lit up when describing the experience. “It has given me a sheer honor to have shared the parade with them, sharing our own traditions, culture, dress. It’s way much honor for me. I’m just hoping something like this [will happen] in Tibet soon,” said Jigme. Keeping Tibetan culture alive in exile has deeper significance for emigres. Jigme thinks of those in Tibet experiencing repression under China’s administration. “I have a responsibility of creating the awareness of what goes on in Tibet, the reality situation,” said Jigme. For Australia’s exile Tibetans, like many others around the world, Losar is a celebration of the resilience of a culture that remains under threat in its traditional home.